Bring an element of drama to your home while enhancing your curb appeal with an elegant Bay window. These stunning windows add space to your room with the addition of a bench area. Fill it with plants, books, and photos, or keep it clear so you can sit down on a bay window seat and enjoy a view that’s larger than the industry average. 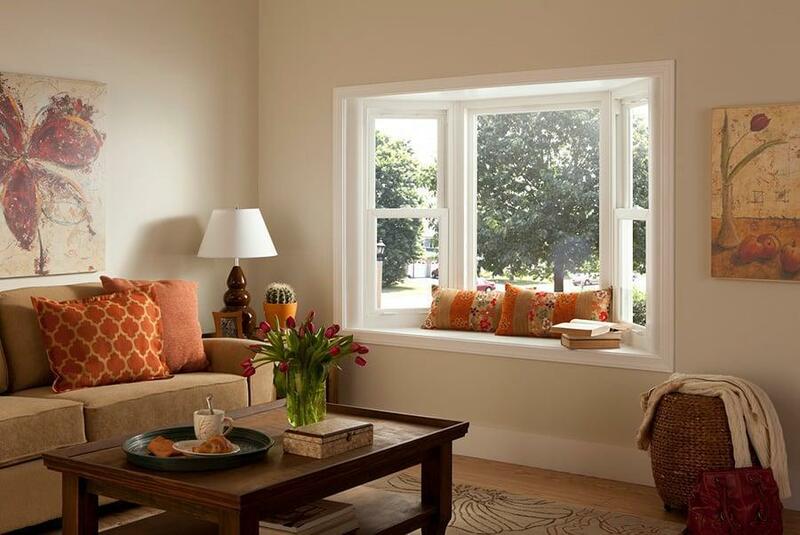 Our bay windows come in 30, 45, 60, and 90-degree angles to fit your space. The seat boards, headboards, and side panels are all manufactured from furniture-grade, 1⅛ inch-thick oak veneer plywood (versus the ¾ inch-thick industry standard). Choose from either Double Hung or Casement windows to capture uplifting outdoor panoramas. As you expand your views, you’ll shrink your carbon footprint by improving your home’s energy performance. With a U-Factor rating between .19 and .30 (depending on the glass package you select), a Solar Heat Gain Coefficient between .21 and .29, and the industry’s lowest air infiltration rating, our windows are some of the most energy efficient on the market. Ice and water shield barriers and NEOPOR® rigid thermal insulation main frames help protect structural integrity and keep the elements out, resulting in dramatic savings on heating and cooling costs while adding a dramatically beautiful bay window to your home. Our Bay windows come in many colors and glass options and are constructed of vinyl, fiberglass, composite, and wood. Laminate surfaces let you match your bay window to the rest of your home without the hassle of staining or painting. Supplemental options can be added to help preserve your pristine views with minimal effort.